CONSIDERING A MULTIPLICITY OF APPEARANCES IN LIGHT OF A PARTICULAR ASPECT OF RELEVANCE. OR: CAN ART BE CONCRETE? 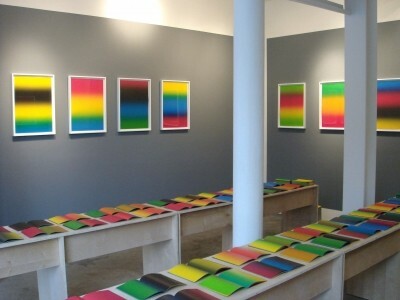 An installation with 16 unique color Iris prints displayed on custom painted walls and 400 unique color books laid out on tables across the entire room. Carolina Nitsch is pleased to present the installation Considering a Multiplicity of Appearances in Light of a Particular Aspect of Relevance. or: Can Art Be Concrete? by Olaf Nicolai. Conceived by the artist as a single work, the project consists of 16 color prints on custom painted walls and 400 color books displayed on tables across the room. Prints and books were done as high-quality Iris prints with the artist randomly feeding different colors one at a time into an offset printing machine. The mechanical movements of the printing make the resulting color mix on each sheet a unique, never to be repeated print. This rarely used process - unlike most commercial printing – allows pure color printing without any dot screens. The 16 framed prints represent the first 2 and final 2 prints from a double-sided printing series of 400 sheets, thereby showing the significant changes in the color mix during the entire printing process. The remaining print run of 400 sheets is split up and made into 400 unique 64-page color books. 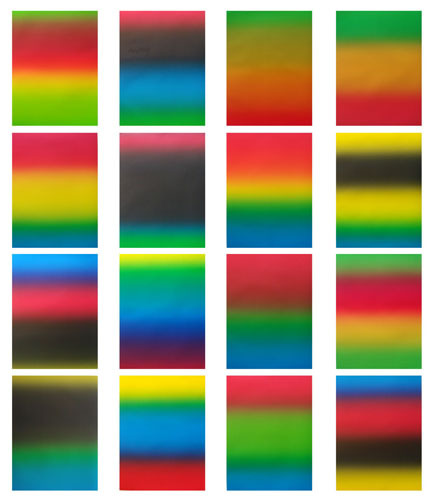 Though the prints show noticeable differences, the general impression at first seems to be one of standardized color repetitions. The work is shown for the first time in the U.S. and illustrates both the conceptual complexity and the physical beauty, Nicolai’s work is known for. The artist often uses everyday objects and cultural products as well as historical references. In his work he combines current questions in politics and contemporary culture with a wide-ranging interest in the natural sciences, architecture, aesthetics, iconography, and history. As the jury of City of Wolfsberg Art Award noted, Nicolai’s focus is on the construction and exploration of new aesthetic contexts, often playing with the difference between naturalness and artificiality. These key elements of Nicolai’s work are all fully integrated and visible in this comprehensive installation. By radically focusing on the specific technique of Iris printing, Nicolai continues and expands his research into the “politics of forms” and into the significance of the sensual for political statements. Iris printing, rarely used today, was often applied for political flyers in the sixties and seventies, combining the technique’s glamour with the politics of that time. Olaf Nicolai has had numerous solo shows, more recently including YEUX DE PAON, Galerie Weltecho, Chemnitz (2008); THE BLONDES, Stadtraum Eppendingen (2007) ; La Lotta, Galerie EIGEN+ART, Leipzig (2006) ; Leonhardi Museum, Dresden (2006) ; Odds and Ends, Projektraum enter, Kunstmuseum Thun, Schweiz (2004) ; Privacy: A programme of symposia, The Henry Moore Foundation, Protoacademy, Edinburgh, Scotland (2004). His participation in group shows include among others Athens Biennial (2007), HALF SQUARE, HALF CRAZY, Centre National d'Art Contemporain of the Villa Arson (2007) ; Modelle für Morgen, European Kunsthalle Köln (2007) ; Wiederaufbau Flamme der Revolution, Städtischen Galerie Wolfsburg (2007) ; The Freak show, Musée d’Art Contemporain de Lyon (2007) ; Nature Design, Museum für gestaltung, Zürich (2007) ; Ordnung + Verführung, Haus Konstruktiv, Zurich, Switzerland (2006) ; Play station, Sprengel Museum Hannover (2006), This is america,!, Central Museum Utrecht, Netherlands (2006) ; Eye on Europe: Prints, Museum of Modern Art, New York (2006), mozart 06, Salzburg, Austria (2006) ; Venice Biennial (2005, 2001), Tokyo Blossoms, Hara Museum of Contemporary Art, Tokyo (2006), Sydney Biennial (2002), Documenta X (1997). Books and catalogs on Olaf Nicolai’s work include La Lotta (2006), Parkett 78 (2006), Rewind – Forward (2003), Enjoy – Survive (2001), 30 Farben (2000) and other titles. His new 35mm Film “Rodakis” was invited to the Forum expanded section of the Berlin Film Festival (2008). Olaf Nicolai received among other prizes the distinguished City of Wolfsburg Art Award (2002), the Villa Aurora grant (2007), the PS1 grant (1998), and the Villa Massimo grant (1997).